“Exploring Virginia’s Regions,” by Robert Morrill, Professor Emeritus of Geography, Virginia Tech. This article discusses the concept of a region and gives examples of some of the systems that help define various types of regions. 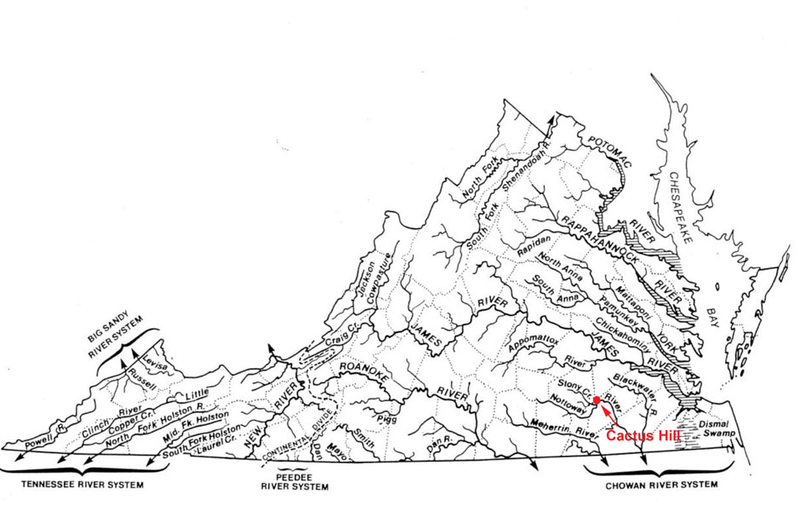 “Virginia’s Physical Geography and Five Natural Regions,” by Susan L. Woodward, Professor Emerita of Geography, Radford University. Descriptions and maps of landform regions, climate, and vegetation regions are provided, as well as a discussion of animal life in the state. The article ends with an overview of the role of natural regions in the colonial settlement history of Virginia. “First Virginians: The Native Americans of Virginia” by Susan L. Woodward, Professor Emerita of Geography, Radford University. Somewhat out of date now (Cactus Hill, for example, is not mentioned), this article nonetheless provides useful information on native peoples from PaleoIndians to the Woodland Indians present at the time of contact. The status of Virginia tribes as of 2004 is also discussed. One entry (http://blog.richmond.edu/openwidelookinside/archives/330) deals with “There’s a Map on My Lap” a book by Tish Rabe, using Dr. Suess’s Cat in the Hat character to teach basics about map reading. You can see and hear the book read at http://www.youtube.com/watch?v=NazvXwWumaQ. Highly recommended by Donna Fontaine, 4th grade teacher at Westside Elementary School, Isle of Wight County Schools. It describes life during the American Revolution and includes Jack Jouett’s ride. See photos from a field trip to historic sites mentioned in the book. The latest booklet from Judy Bloodgood Bander. Its 39 pages delve into the history of the battle and contain some maps. Contact the author for information on obtaining a copy of the book (jbander1@verizon.net). Books across Virginia’s 5 Regions. An annotated list of books prepared by Donna Fontaine, 4th grade teacher, Isle of Wight County. Some ideas for integrating the geography SOLs associated with Virginia Studies (in 2004) into your lesson plans. VGA floor map of Virginia.The map measures 8’ X 16’ and emphasizes the physical features of the state. Great Bridge is shown on an old map at http://en.wikipedia.org/wiki/File:EasternVirginia1775.jpg. See also The Battle of Great Bridge: “Boys, stand to your arms” described under BOOKS. Maps and accompanying lesson plans produced by the VGA. Digital Atlas of Virginia, produced by Virginia View. Old Maps Online, provides access to some historic maps of Virginia. Pre-1945 U.S.G.S. topographic maps of Virginia from the Perry-Casteneda Library Map Collection, The University of Texas at Austin. Most maps are from the early 20th Century, a few form late 19th Century. Most are at a scale of 1:62,500 (1 inch to the mile). See also: Library of Virginia map collections. “COAL” is a PowerPoint presentation prepared for teachers participating in the Transect Virginia course. Prior to arriving and visiting various coal mining sites, presentations introduced teachers to the Southwest Virginia region and the coal industry. While reviewing these slides, be cognizant of the explanatory notes included with each slide. Virginia View. http://virginiaview.cnre.vt.edu. A site devoted to remote sensing with resources to support the K-16 educational community. Includes lesson plans, some keyed to SOLs. Also see the Digital Atlas of Virginia. access to lists, descriptions, and maps of Virginia’s rare species, invasive species, natural communities and ecosystems and natural area preserves.